Cartoon humor featuring my Donald Trump T Shirts is available now and wanted to offer it’s availability via my online store. 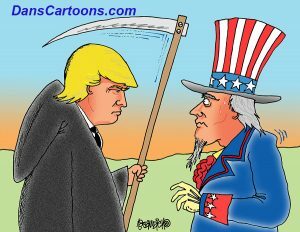 The image is a captionless cartoon that shows Donald appearing in the form of the Grim Reaper holding his scythe and staring at a very frightened looking Uncle Sam. The look on Uncle Sam’s faces is grimacing in fear as though something bad is about to happen to him while Trump stares menacingly at him. I wanted to create this kind of cartoon based on how I saw voters who voted for the Democratic nominee. They are represented in the form of Uncle Sam of course. Granted, The Donald is rough around the edges, but let’s be honest…he is not a polished politician with years of experience negotiating with other elite politicians. He’s basically a chief executive office of his own company who wanted to take a turn running for president of the United States. He certainly isn’t in it for the money, nor do I see him in it for the “power”. What kind of power would a seventy year old man really want, when he is already a billionaire. Think about it. He may genuinely want to do something for the common good of the country, no matter how big or how small that so called “good” may be. There may be just something in it for him, perhaps something based on taxes, who knows. But one aspect of his platform many people ought to consider is his focus on building a wall along the southern border. Consider something for a minute. We have a big drug problem and probably the greatest scourge to hit our country since Nancy Reagan’s “Just Say No” campaign from the 1980’s. Heroin has saturated the entire country, along with methamphetamine and of course marijuana. A wall along the southern border could very well act as a deterrent to the Sinaloan cartel with a wall that will no doubt make it much more difficult for a free flowing river of drugs. If properly monitored by manned patrols, technology such as drones and underground sensors, think of the potential this could offer the Drug Enforcement Administration in it’s work to monitor the border. Not to mention the fact it will enhance safety for land owners who’ve literally had to patrol their property on their own or hire armed services to assist them. May even appeal to republicans, who these days seem to have a better sense of humor. No matter what, the use applied to this t-shirt is, wear it proudly to either make your own personal statement or show your support from Uncle Same. I also offer alot of cartoons about politics and politicians in Washington, D.C. which you might find useful for a special use and visit the link at the bottom of this page to review many single panel cartoons I have created around the topic. Thanks for looking at my t-shirt about Donald Trump and if you have any questions prior to purchasing the shirt, don’t hesitate to ask. Don’t forget, you can also customize the design on your shirt. Simply click the cartoon which opens it on a template, allowing you to add text that you choose, either above and/or below the cartoon! Another important factor to keep in mind is that when you see the page featuring the cartoon ion the sample t-shirt, not directly to the right, you will see “Style – Men’s basic t-shirt” and click that link on the right: “More (109)” to access the cartoon on dozens of other styles of apparel ranging from crew neck shirts, to tank tops and long sleeve shirt….you can access many buying options! I offer more political cartoons that can be licensed for other professional uses if you are interested and I urge you to ask questions if you have them. 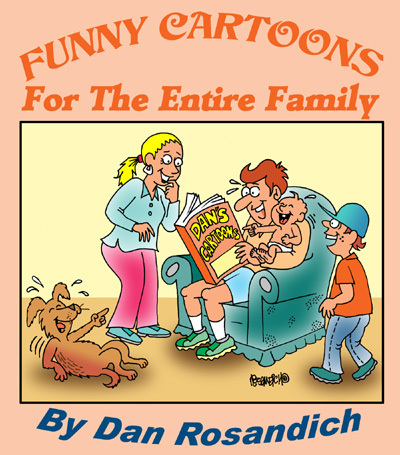 Thanks for taking the time to browse my cartoon catalogs.